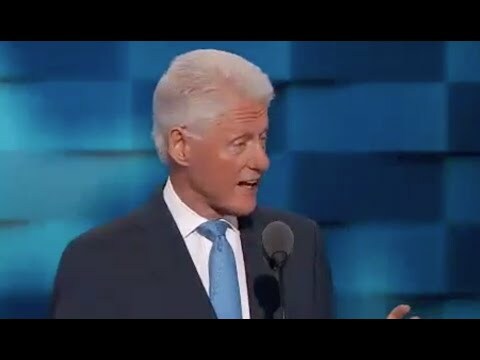 Just hours after his wife became the first major-party female presidential nominee in United States history, former President Bill Clinton delivered a personal and impassioned speech Tuesday night at the Democratic Convention in Philadelphia that detailed his own relationship with Hillary Clinton both personally and professionally, portraying her as a "change-maker." "She's still the best darn change-maker I've ever known," he said. "You can drop her in any trouble spot. Pick one. And somehow, someway, you can come back in a month and she will make it better because that's the way she is. “She did all of this while being a full-time worker, a mother, and enjoying our life," he added. Bill Clinton began his keynote address describing his first encounter with then Hillary Rodham when the two were Yale University students in the spring of 1971 and their courtship, through his first run for Arkansas governor and his two terms as president, and now, as Chappaqua residents, where the Clintons have resided since 1999, just before Hillary Clinton's tenures as U.S. senator from New York and secretary of state. Bill Clinton also took a roundabout shot at Republican nominee Donald Trump, who owns an estate in Bedford, over his mocking a New York Times reporter with a disability in a speech during the primary campaign during the spring. "She never made fun of people with disabilities," Bill Clinton said of Hillary Clinton. "She tried to empower them based on their abilities." A brief video by Hillary Clinton from the Clintons' home in Chappaqua thanking Democratic delegates for nominating her followed her husband's speech. "What a great honor you have given me and I can't believe we've put the biggest crack in that glass ceiling yet," she said in the video, which was shown to delegates and via TV networks live via satellite at 11:15 p.m. "Thanks to you and to everyone who's fought so hard to make this possible. "This is really your victory. This is really your night. And, if there are any little girls out there who stayed up late to watch, let me just say, I may become the first woman president, but one of you is next."